A gorgeous look featuring a kitty cat with cute little whiskers dreaming on a little cloud! 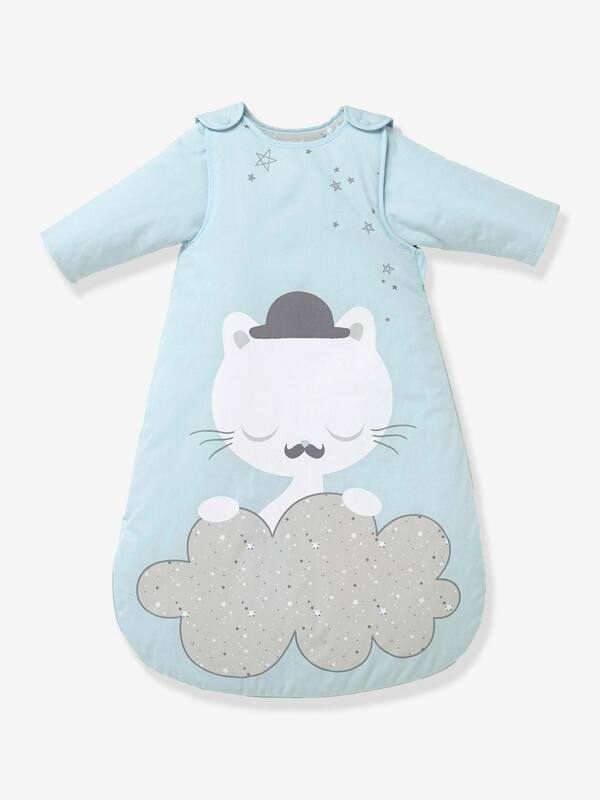 This must-have baby's Sleep Bag for sweet dreams at beddy-byes can be worn with or without sleeves. Full-length zip fastening for quick easy use. Hardwearing press-stud fastenings with fabric reinforcement inside. Long sleeves attached with press-studs. The Sleep Bag is recommended for use with babies up to 18 months in the appropriate size for the child. TOG 2. What is TOG? , outer in pure cotton percale. in 100% cotton jersey knit. Cute baby sleeping bags are the perfect way to keep your little ones cosy, warm and safe during the night or when you pop them down for a nap. They are ideal for newborns up to 36 months old and reduce risks that come with blankets and duvets. A selection of the baby sleeping bags even come with detachable arms, so they can easily be removed if they do get too hot - or be added for extra warmth. At Vertbaudet we have a wide range of colours and designs for you to choose from.